Central idea: The king of the kingdom of God. Doctrine: The kingdom of God and the last judgment. Practical application: Living today with the end in mind. To view Lectionary 160, click here. 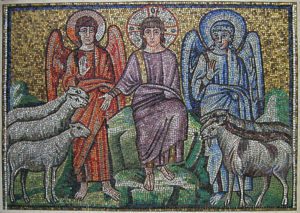 The good shepherd is an image of the good leader, ultimately the good king. In this oracle, the LORD declares that he will be the shepherd of his Chosen People. This oracle is fulfilled in Our Lord Jesus Christ, King of the Universe. This good shepherd will set to work immediately and will continue without stop until he has re-gathered the flock and restored each animal to health. This is fulfilled in Christ’s work to save and sanctify us. But why will God destroy the sleek and strong? The reason is that they only looked out for themselves. They either gave no thought to or actually harmed the weaker members of the flock who were lost, injured, or sick. This judgment will take place when Christ returns. For the person who can say, “The LORD is my shepherd,” there is no fear in Christ’s return. Rather, there is great joy, for Christ returns to look after the person as a shepherd looks after a sheep who knows his need of a shepherd. The smart sheep knows he needs a shepherd. We, too, need God to find, save, guard, and guide us, because by our own powers we cannot defeat the forces of sin, suffering, and death arrayed against us. In the Lord’s Prayer, Christ instructs us to pray “Thy kingdom come, thy will be done on earth as it is in heaven.” In this reading, St. Paul is describing how the kingdom of God will become universal. The first fruits of the “harvest” is Christ’s resurrection from the dead, which has occurred. Then at his second coming all who belong to him will rise from the dead. They are already subject to him. They have become subject to him by the way they have lived. Then, like a warrior king, Christ will conquer “every sovereignty and every authority and power” which is opposed to him, “enemies” of which death the last and greatest. Then when everything is subjected to Christ, Christ will subject himself to God the Father “so that God may be all in all.” God is not all in all now because there is so much resistance to him. God’s “reign is a dynamic exercise of creative power, an outpouring of life and energy through the universe, with no further resistance. This is the supremely positive meaning of ‘subjection’: that God may fully be God” (N.A.B. footnote 1 Cor 15:28). In Ezekiel’s vision, there are some people who are sleek and strong while their fellow men are lost, in need of rescuing, hungry, tired, injured, and sick. In that prophecy, God himself will tend to those in need, while he will “destroy” the sleek and strong. It must be that God negatively judges the sleek and strong because they did nothing for their brothers in need when they could have. This comes into focus in the parable of the sheep and the goats. Those of us who do nothing for the hungry, thirsty, naked, ill, and imprisoned will be condemned while those who do something for them will have eternal life. When we pray, thy will be done, “we ask our Father to unite our will to that of his Son, so as to fulfill his plan of salvation in the life of the world” (CCC 2860). “Christ the Lord already reigns through the Church, but all the things of this world are not yet subjected to him” (CCC 680). “On Judgment Day at the end of the world, Christ will come in glory to achieve the definitive triumph of good over evil which . . . have grown up together in the course of history” (CCC 681). “When he comes at the end of time to judge the living and the dead, the glorious Christ will reveal the secret disposition of hearts and will render to each man according to his works and according to his acceptance or refusal of grace” (CCC 682). The Catechism tells us that “In the Lord’s Prayer, ‘thy kingdom come’ refers primarily to the final coming of the reign of God through Christ’s return.” Does this mean that the faithful just sit back and wait? “[F]ar from distracting the Church from her mission in this present world, this desire [to see the kingdom of God on earth] commits her to it all the more strongly” (CCC 2818). This is why the Church never stops proclaiming the Gospel, teaching Christian faith and morals, and providing the Sacraments. This is why every lay member of the faithful should take seriously the call to be an evangelist, which presupposes knowing and living the faith. Thus, because we want God’s kingdom to come, we know, live, and speak to others about Catholic faith and morals. The Catechism goes on to explain how we cannot really say, “Thy kingdom come” unless we live the faith and its demands. Thus, we cannot evangelize unless we are engaged in the personal battle between God’s will and our own often disordered passions. To use the image of Christ as the Warrior-King, we are soldiers in Christ’s army fighting to subdue creation to him so it can be turned over to the Father. But the enemy we fight is our own selves! Similar to our concern to advance the kingdom of God on earth now, the Church reminds us that “By a discernment according to the Spirit, Christians have to distinguish between the growth of the Reign of God and the progress of the culture and society in which they are involved.” Progress in the kingdom of God is not the same as economic, cultural, medical, technological, or scientific progress. However, this distinction is not a separation. “Man’s vocation to eternal life does not suppress, but actually reinforces, his duty” to contribute to “the progress of the culture and society in which” he lives. Thus we have the “duty to put into action in this world the energies and means received from the Creator to serve justice and peace.” (CCC 2820) Laypersons should be especially excited to contribute to human progress in the temporal order through their work, whatever it is. To summarize, we care about becoming personally transformed into the image of Christ so that we can more effectively advance both the temporal and eternal orders.